[Update] I’m back in Seattle and (mostly) recovered. Thanks to everyone that came to either of my User Research or Game Design talks. Special thanks to all the readers that introduced themselves; it seems like I am reaching my intended audience of “veteran game designers”. A narrow demographic, to be sure. Unfortunately, I spent too much time networking and not enough time attending interesting sessions, but I may cheat and do a wrap-up based on the GDC Vault at some point. If you are in the audience and read the blog, please come up afterword and say hello. I’d love to find out who is reading this thing and get your feedback face-to-face. I’ll also be posting summaries and responses to the lectures and panels I attend when I get back. 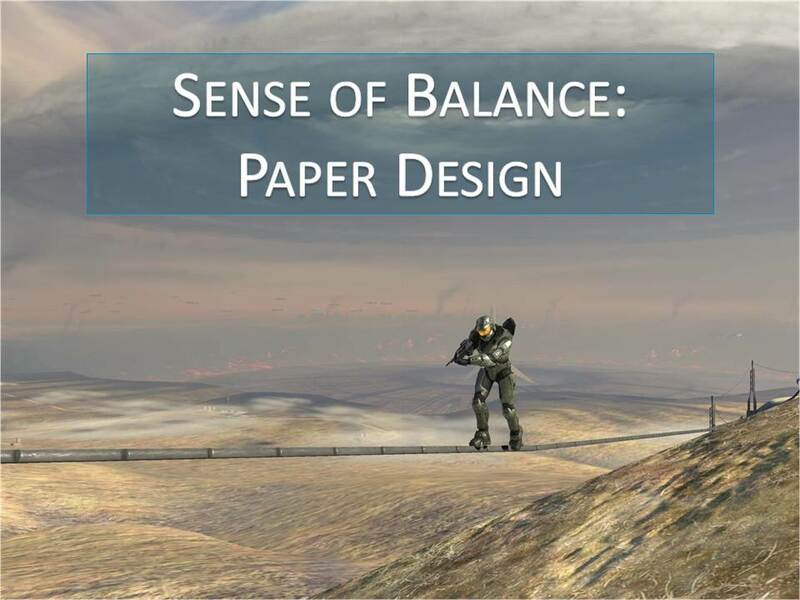 How do you develop your sense of balance for paper designs? It can be done, you can look at a paper design and have an intuition about how it will work. You are looking for the role, and for a couple key factors that are the results of the role. 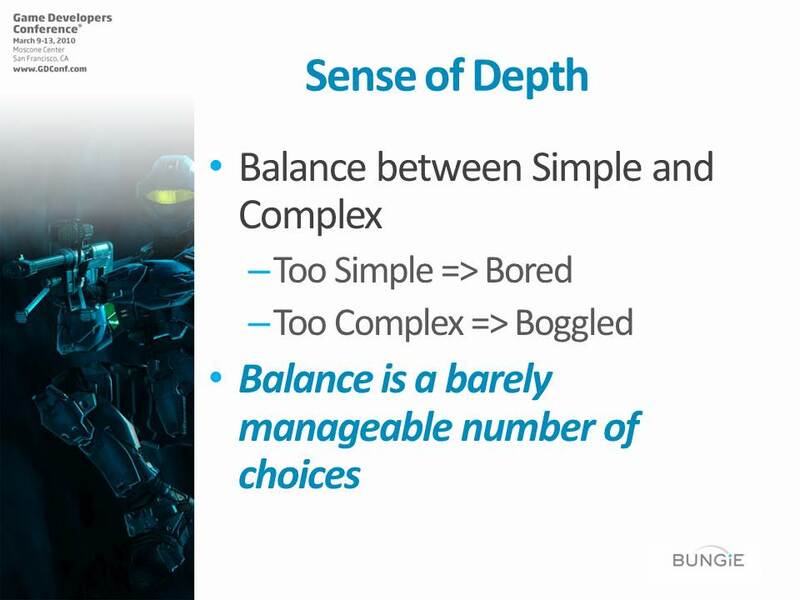 This is where roles come in because they provide depth without increasing complexity. The Sniper Rifle is the best weapon in some situations. 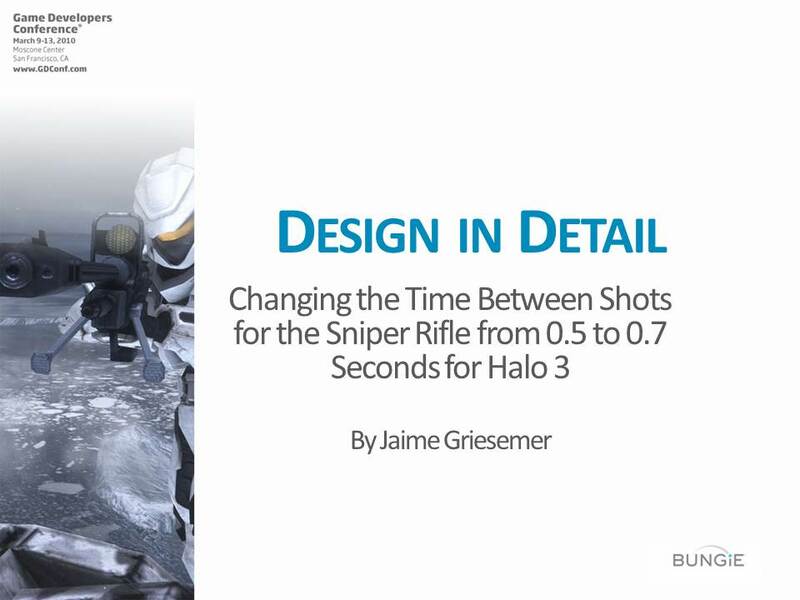 The Sniper Rifle has a clear role, times and situations where it is the best. 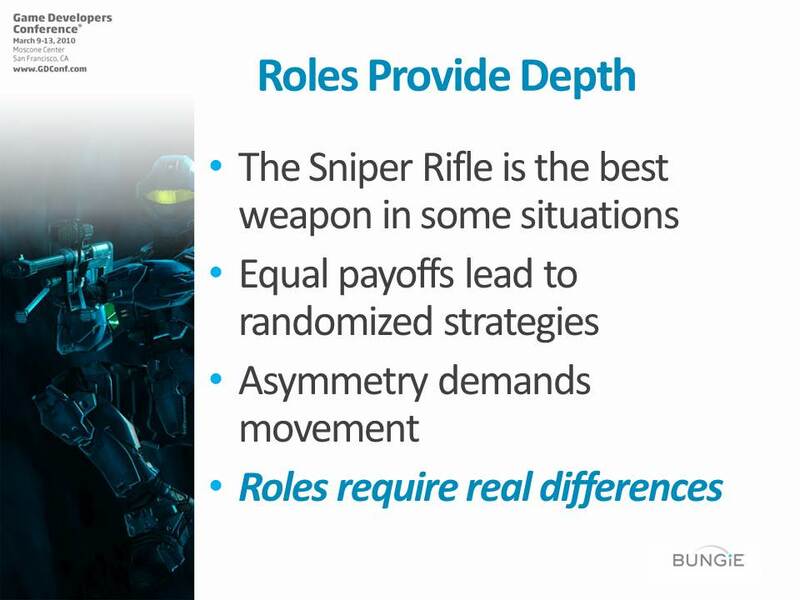 The payoff for using the Sniper Rifle is different depending on what situation you are in. This is good, because game theory tells us that if all the possible strategies have the same payoff, players will pick randomly. As game designers we want to avoid choices that don’t ultimately matter. 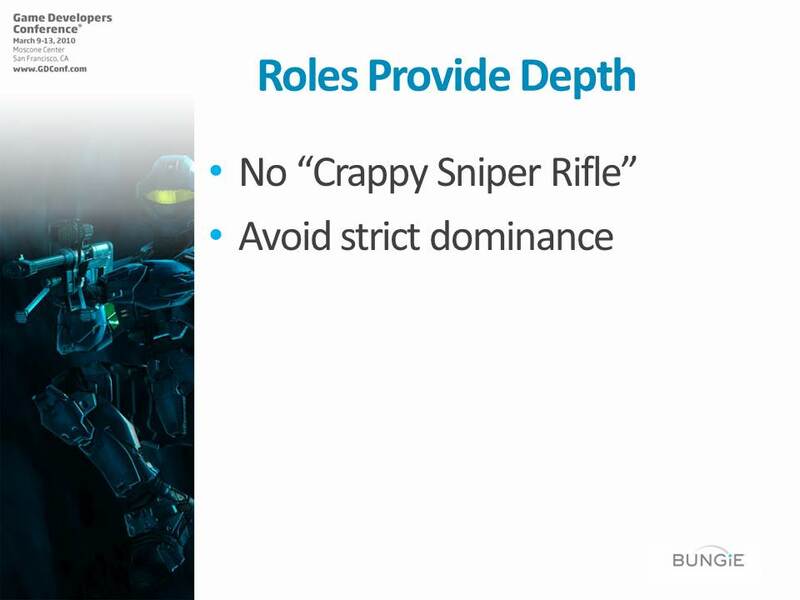 Roles are also good because they cause asymmetry, which demand movement. There are incentives to move from one strategy to another depending on the situation. 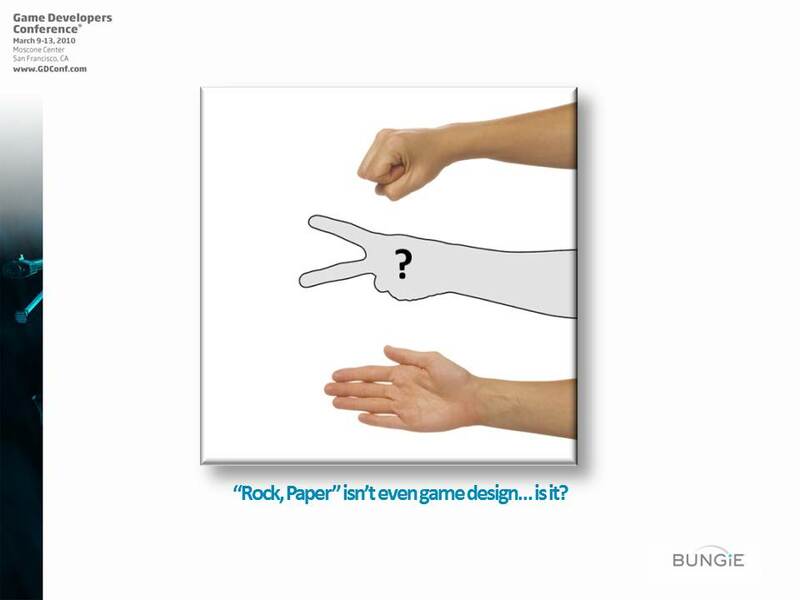 One of the tropes of the design community… Rock, Paper, Scissors. But it’s a terrible game!!! Every choice has the same payoffs, so you pick randomly. There is no player agency if their choice is meaningless. This was easily the most controversial slide in this talk. Several people took issue with the fact that RPS is a bad game because many journalists and designers improperly use it to describe a situation where one unit strictly dominates another, like in a good RTS. But imagine a RTS game where you could only pick one unit, you had to pick it before the game started, and if you picked wrong you couldn’t possibly win, It’d be a bad game! So I am not using RPS in the casual sense of “a game with counter-strategies” but as defined in game theory; Hopefully that clears things up a bit. I also got a lot of people saying, “RPS is the foundation of Street Fighter!” This is true, somewhat, more than the RTS case, anyway. but imagine a turn-based game of SF where the first hit wins the match. Again, a bad game. -SF is a series of RPS interactions, so things like reputation and anticipation come in. -It is played very quickly, so low level decision making and muscle memory determine your strategy more than choices, so it isn’t truly random. 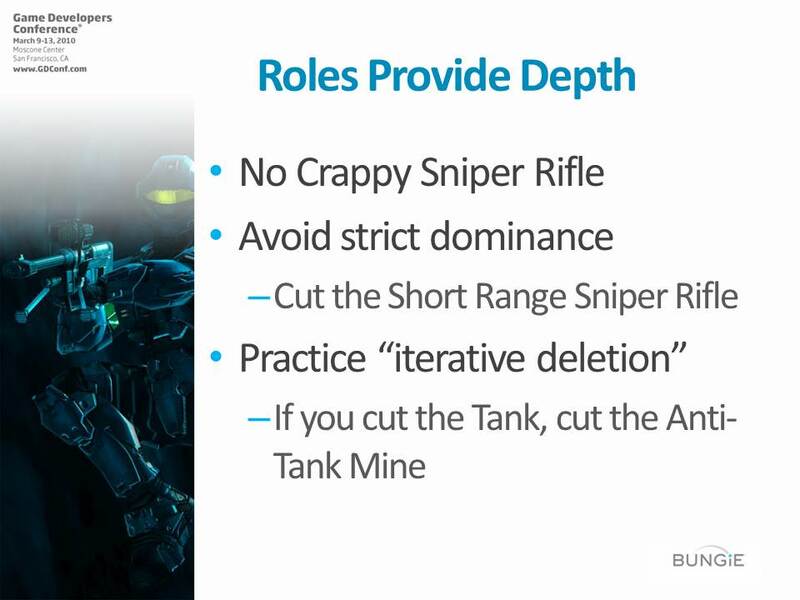 Believe me, I am not trying to insult RTS games or SF (or even Ro Sham Bo Tournament Champions) but to encourage designers to see how roles lead to non-equal payoffs, and therefore avoid random strategies. 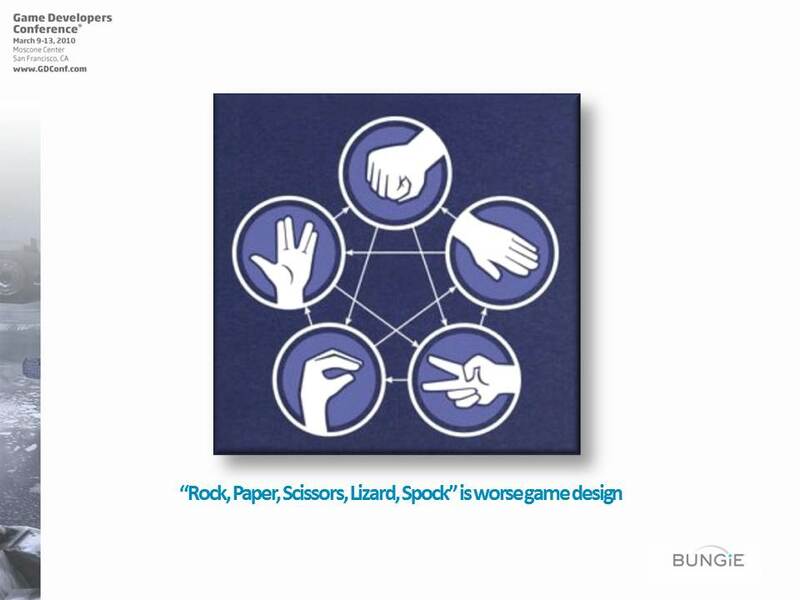 “Rock, Paper, Scissors, Lizard, Spock” is even worse game design. (This game is from the show “The Big-Bang Theory”) It looks more interesting, but it isn’t; it is just more complicated. It will still reduce to equal payoffs and random play. 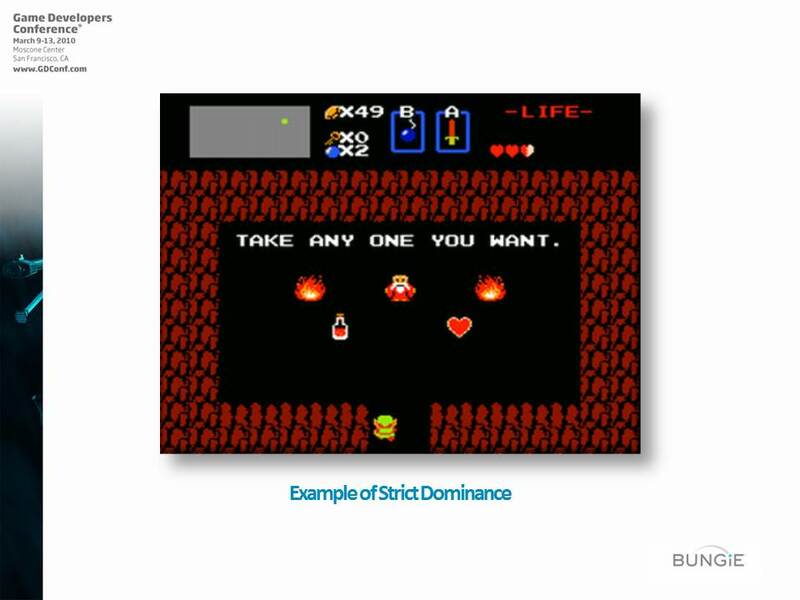 Avoid strict dominance…Wait, what is strict dominance? Who picked the Health Potion? The single-use health replenisher you can buy for 30 rupees? Who picked the Piece of Heart? The totally unique health-extender you can never buy? Iterative deletion means you remove all the dominated strategies, then you remove all the strategies that were only good against those strategies. 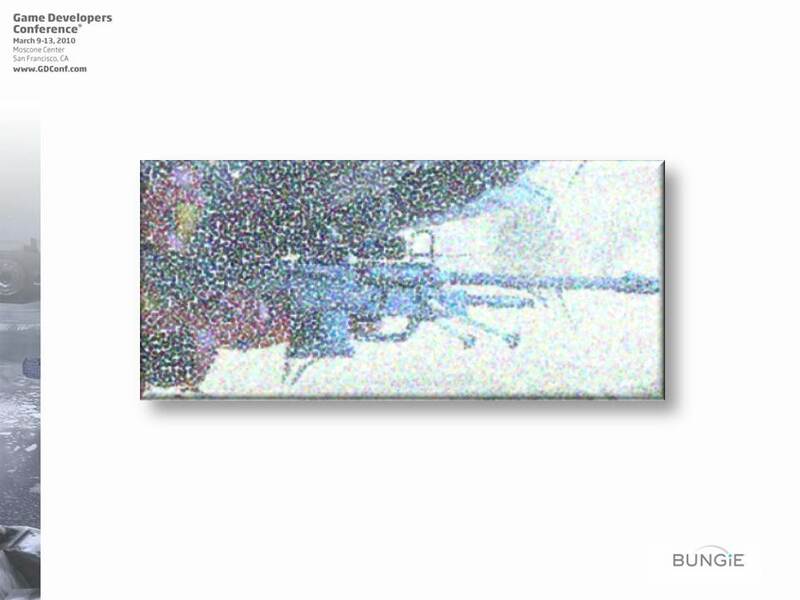 If you cut the Tank, cut the Anti-Tank Mine. Often when you are making cuts in the final stages of production, it seems like a good idea to cut a little bit from a lot of places, but it is uaully better to cut an entire game mechanic and all of the game elements that use it. Otherwise you end up with several systems that feel like they have missing pieces, rather than a single system that is entirely absent. 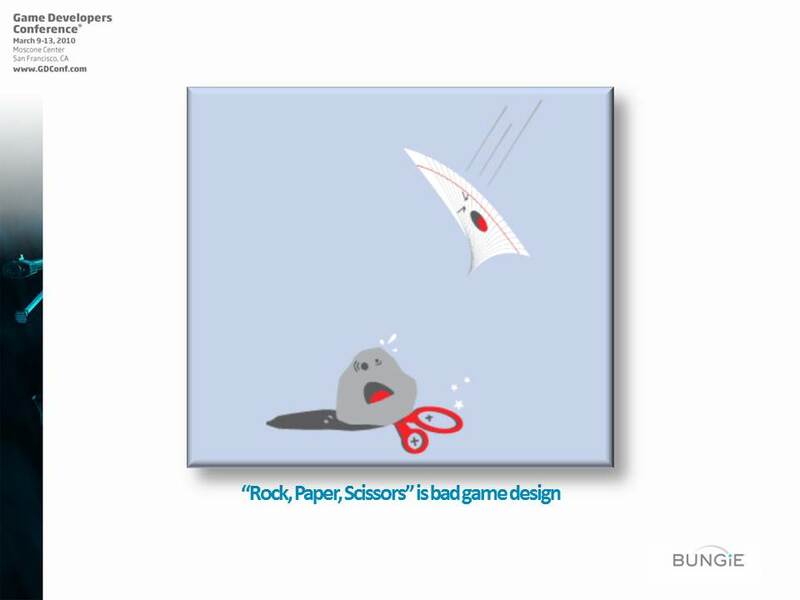 After GDC I got challenged to come with an example like Rock, Paper, Scissors that is good game design, so I invented Pirates, Ninjas, Sharks. Each has their own strengths. 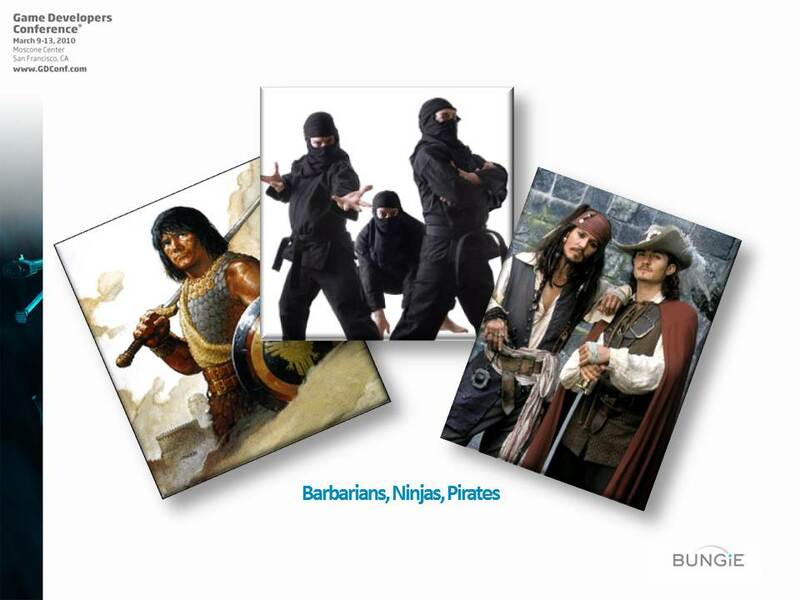 Ninjas are better at night, but Sharks always win in the water, while Pirates come in crews, etc. A good game is one that you can argue about forever. 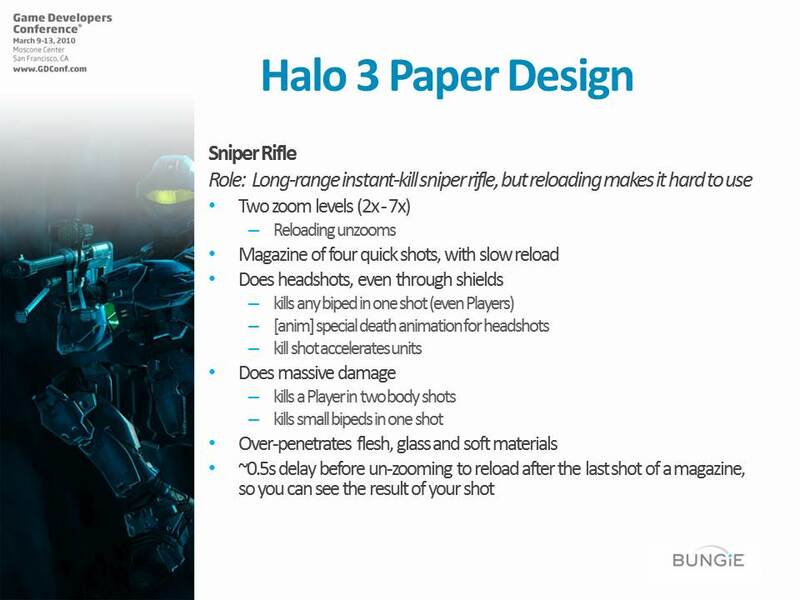 The first step in Halo 3 was the paper design. This is one of about 4 slides for Producers. 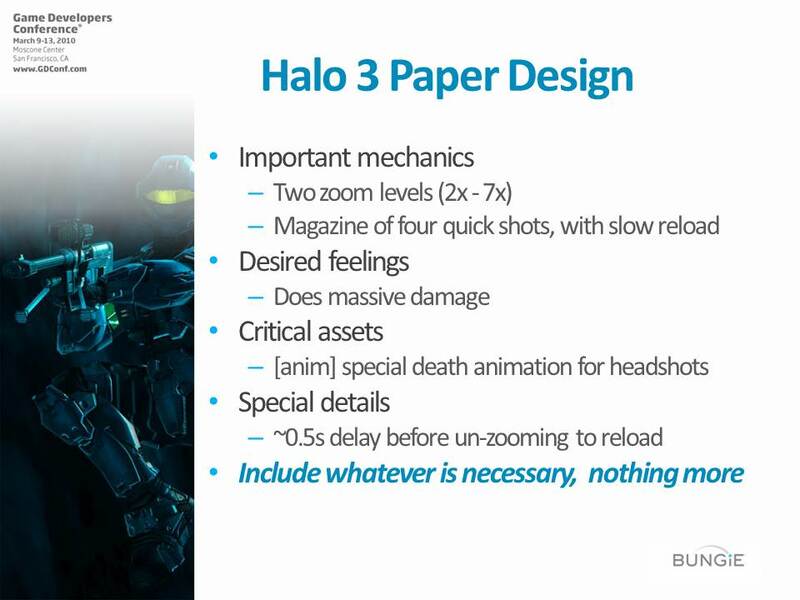 The Paper Design should happen in Pre-production. You need to do paper designs first so you don’t have 40 artists sitting around while you do it. On the other hand, if you leave it too early, you are going to waste lots of time later. So as producers, you need to find creative ways to give us room in this stage. 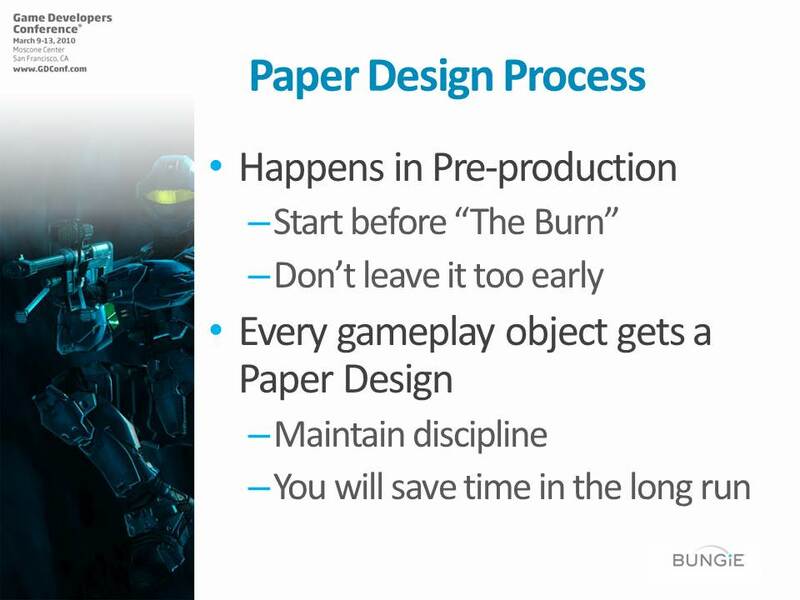 Every gameplay object should get a Paper Design. Don’t let Designers hand wave, because we are great at it! If we can’t write it down it means we haven’t figured it out. Lack of design discipline is a huge threat to your project. On the other hand, if you have a designer that has proven his discipline, then trust his paper design. Take off your design hat before you mess up the game! Nobody has ever seen this outside of Bungie. 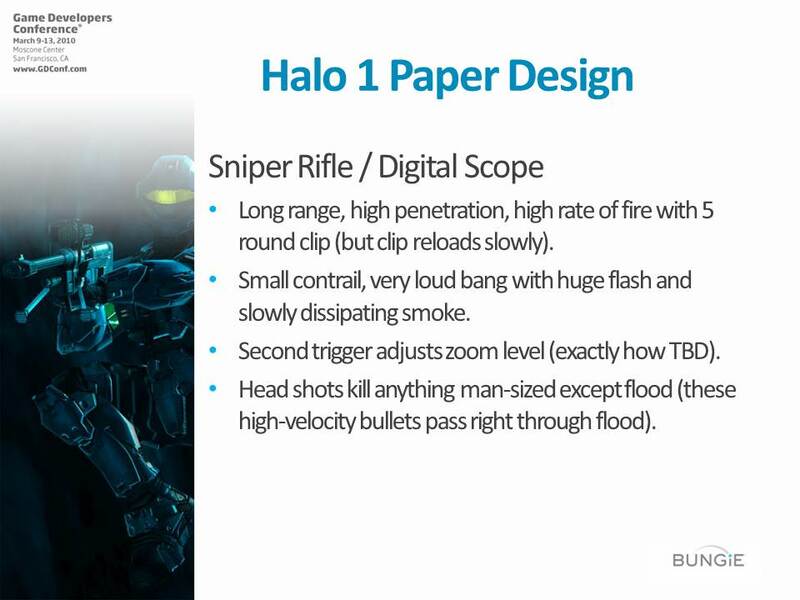 It’s the original paper design for the Halo 1 Sniper Rifle. It is embarrassingly simple, but it is better to be simple than overly complicated. Some specifics are wrong. 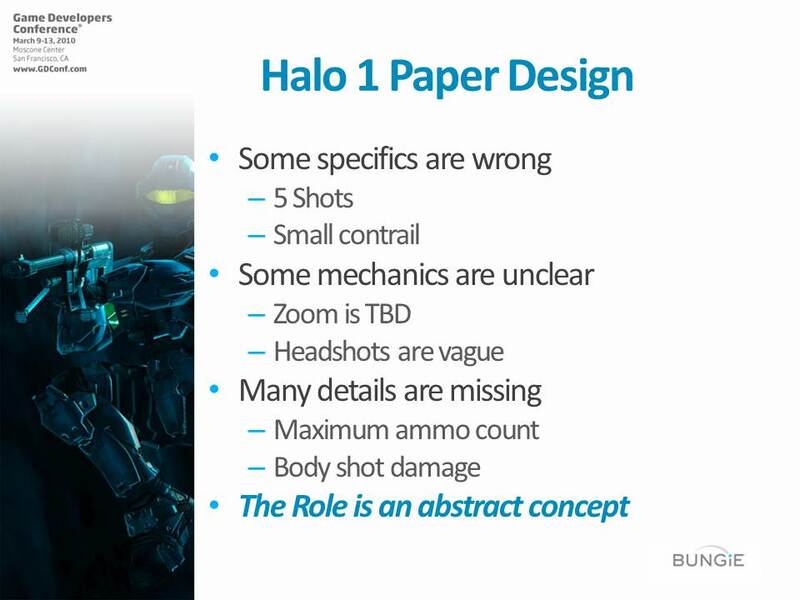 That’s because at some point the paper design is abandoned in favor of the existing object in the game. Some mechanics are unclear. That’s because it is often difficult to capture an entire system inside a single paper design. Many details are missing. A paper design should only include crucial or unique information, not every trivial detail. It’s very flawed as a spec, but one thing comes through, the Role of the weapon. It might seem like a waste of time to do a revised paper design since it was essentially the same weapon as the first two games. But it is still important to capture and communicate the vision, because not everyone will have the same understanding of what was important in the previous versions. The Role is even more clearly called out. 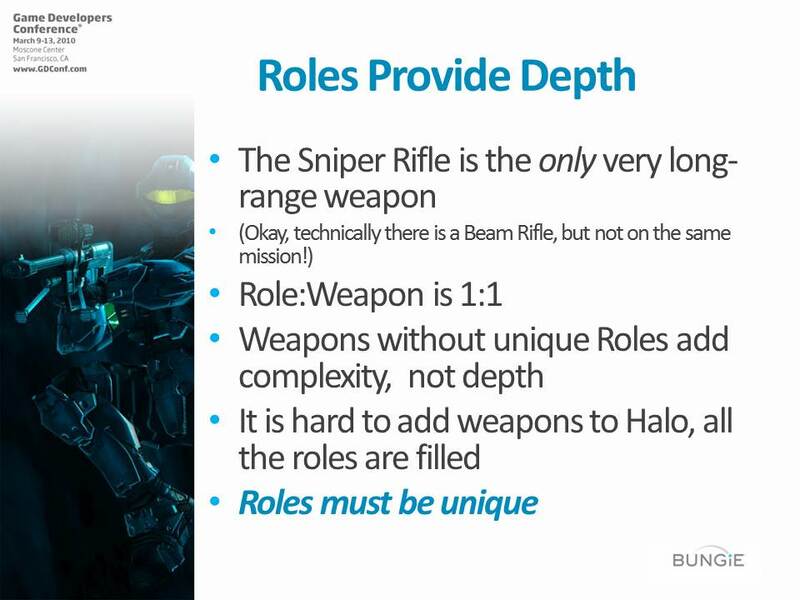 Someone pointed out that Halo has two sniper rifles, which seems to violate the “one weapon per role” rule. 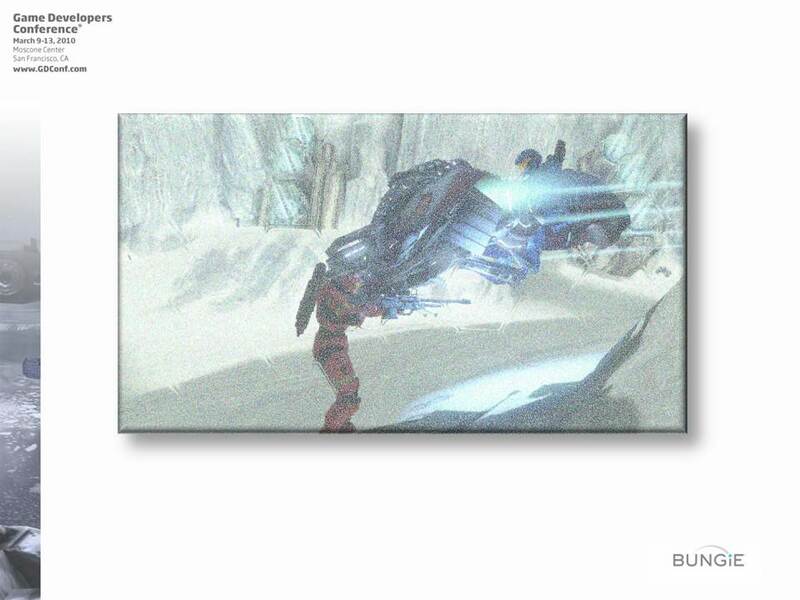 Truthfully, they are right, but the missions required enemy snipers using an alien weapon. 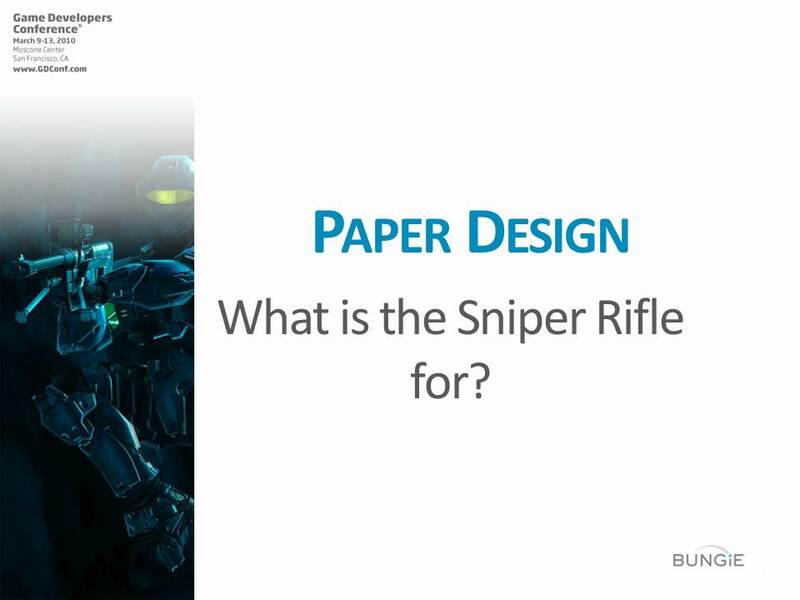 But, even in that case it is a good idea to give them unique gameplay; that’s why this paper design refers to the fact that the human sniper rifle reloads, instead of overheating. 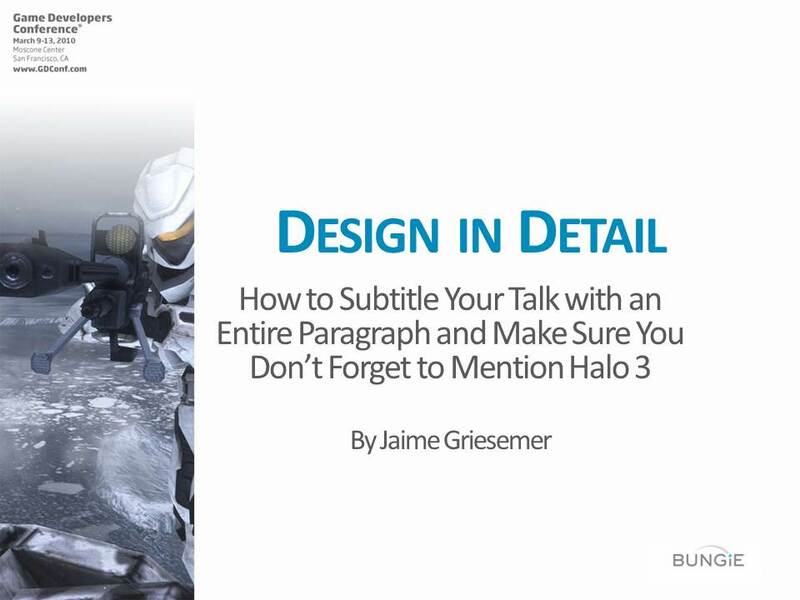 I felt like this slide failed to capture what is really important about writing a paper design, so I wrote a much more detailed post on the topic. 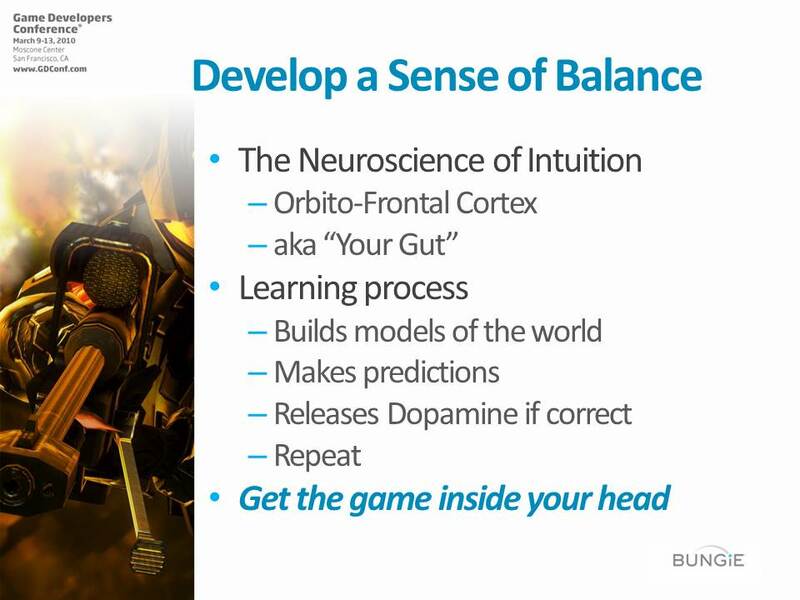 In order to develop a sense of balance, you need to understand how your brain works. You have an Orbito-Frontal Cortex; It’s called that because it is located behind your eyes, but it’s really your Gut. When you learn something new, it goes through a process where it builds a model of the world and makes predictions about that model. If it is right, it releases Dopamine, which cements the model a little bit. 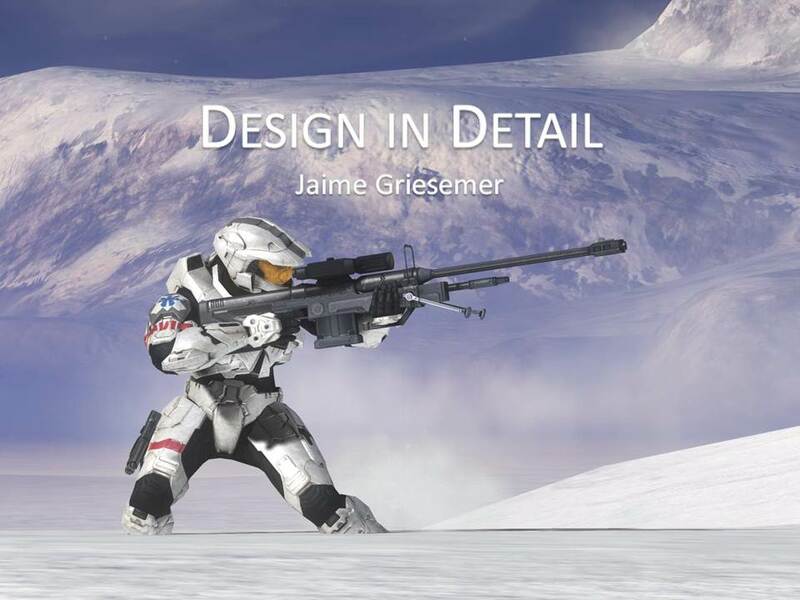 If you are a designer, you need to familiarize yourself with how this process feels, because your ultimate goal should be to get the game inside your head. You want the model in your gut and the game in the world to be the same. You should be able to predict how the game will play in a given situation before actually picking up the controller. 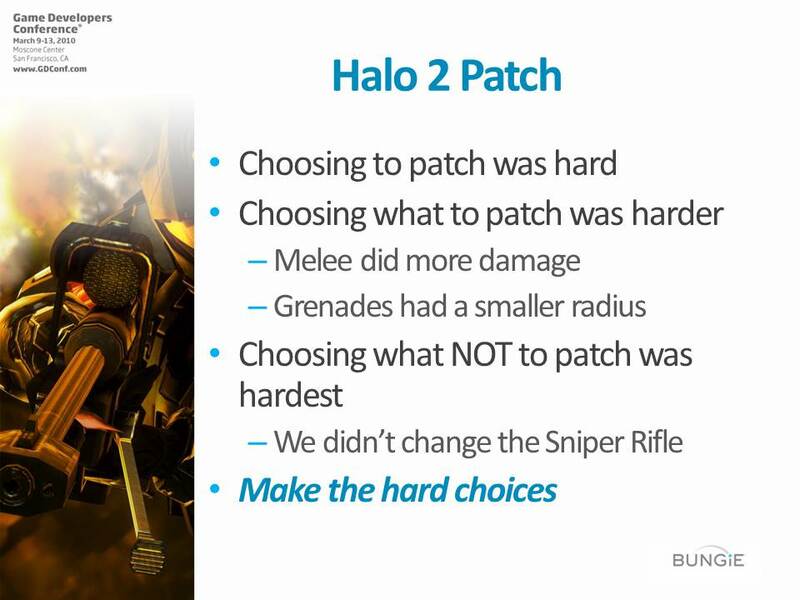 Choosing what to patch was harder. You want to tweak everything, but you can’t because then testing gets out of hand. Games that have the ability to easily change the gameplay often over-patch fopr precisely this reason. Which brings me to my final theme: Make the hard choices. Balancing is hard because it requires you to do things you don’t want to. And it is tricky because there are so many ways to confuse or talk yourself out doing it properly. But the worst thing you can do is leave the decision up to chance because you can’t make a tough call. Why are these choices hard? Again, the answer is your brain. You also have a Pre-Frontal Cortex. It’s called that because… Who knows? We call it your brain. It is a poor tool, but it’s what we have. You can’t reason out everything, in fact you can’t reason out very much at all. There are so many ways that your logical mind has to trick you. You must confine yourself to reason on the detail scale. You just can’t hold enough factual information in your brain to make rational decisions about very complex situations. Radiolab is a great show on New York Public Radio. They have a podcast, you should subscribe! In an episode called “Choice” they describe this experiment where psychologists give people a number to memorize, 2 digits to 10 digits. Then they send them to another room to repeat their number. 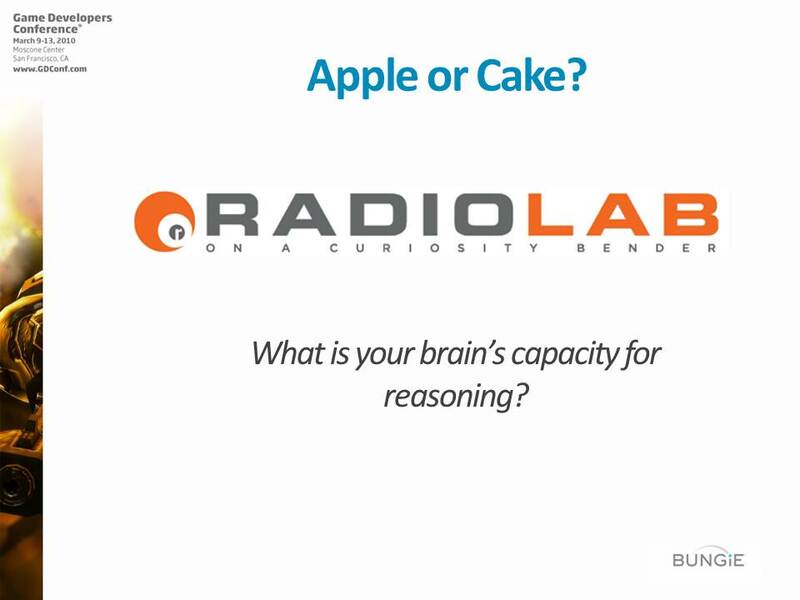 On the way, they have someone interrupt them (All good psychological tests are about fooling the subjects) and ask them if they want an Apple or some Cake. The people with short numbers pick Apples at a high rate; Apples are better for you, fewer calories, watch your waistline. Those trying to remember longer numbers more often choose Cake. They are so busy with numbers, they make the decision emotionally. That’s right, 7-10 numbers are enough to completely fill your rational brain! My high school calculator had more horsepower than that! So when you have to think rationally, think about details or you will get hopelessly lost. And fat. I am going to use these themes to explore the Detail. Now let’s get to the Sniper Rifle! 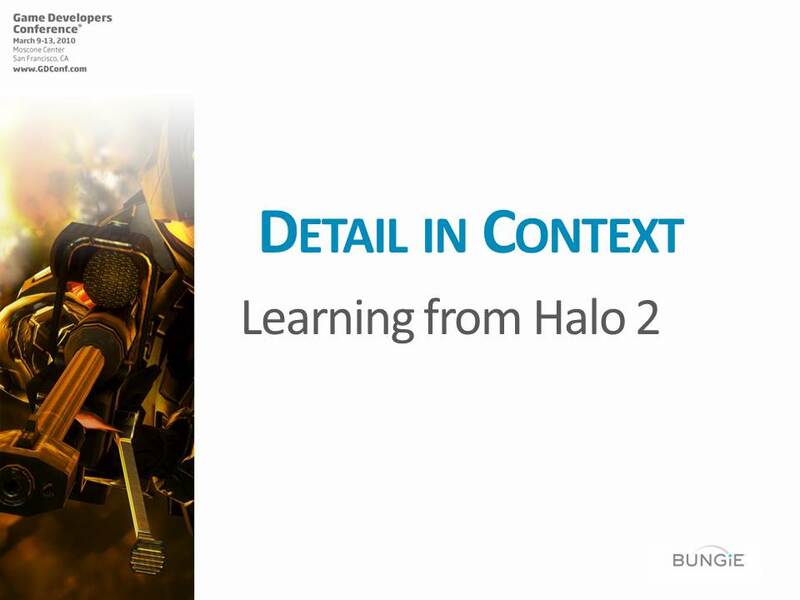 Ok, so when I gave this talk at GDC I didn’t have time to finish, even though I was talking very fast. I did better when I gave it at Blizzard, until my voice ran out and I could barely speak. So I probably should have cut some ideas out and saved them for this year. I do see the irony of failing to trim a talk that advices designers to drastically reduce the scope of their game as early as possible. But to me, the value of GDC has always been that it makes me think about my own problems from a different perspective and inspires new ideas as I listen. So I wanted to cram as much idea-fodder into the talk as possible, not produce a fluid, polished experience. I did not make the call on the Pistol, I didn’t even know about that call, it was made directly to the cache file after everything was supposed to be locked down, in fact… but I’m not bitter about it. I did decide to give the BR some spread, which has been the topic of much debate. Luckily Reach has been even more controversial, so nobody remembers it anymore. 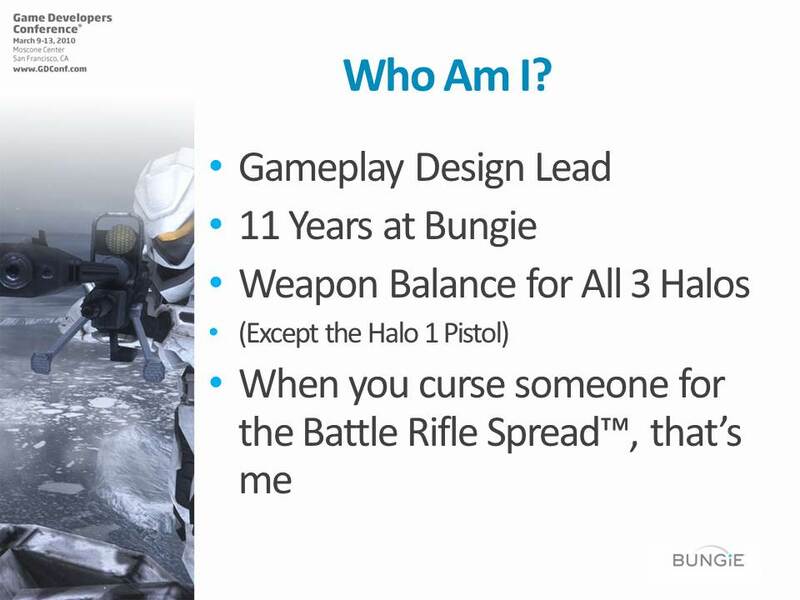 It’s interesting that every single Halo game has had major controversy over the MP starting weapon, I bet you could write an interesting talk about that. In 2009 I was at the Art Institute of Chicago visiting my family. (I grew up in and around Chicago.) I saw one of the most famous paintings of all time and took a picture of it with my phone. I actually did have the idea for this talk at exactly that moment, at least vaguely. Any guesses as to the painting? It’s “A Sunday Afternoon on the Island of La Grhand Zhot” by Zhorzh Soo-rah (I really wanted to pronounce his name right…heh) This painting inspired my talk (and its very long title) Still don’t recognize it? Here it is from a little farther back. This painting isn’t famous for how it looks, or what it shows, but how it was made. 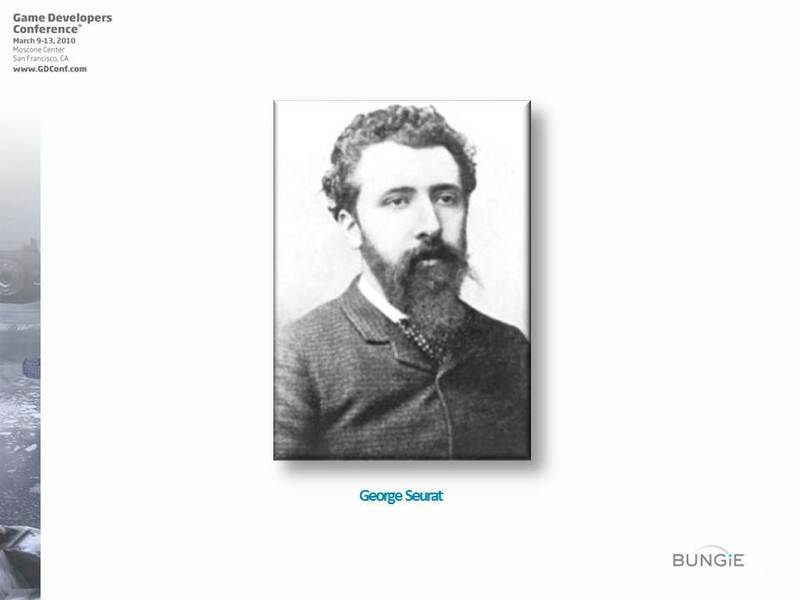 Seurat lived in the 1800’s. He was very interested in how we perceive color. Scientists were just discovering that what we see as one color is actually a mixture of different colored light. 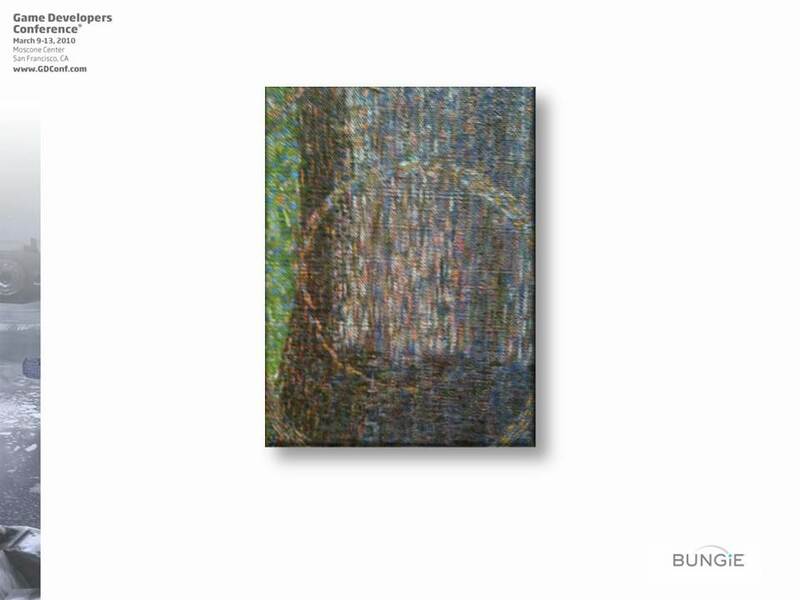 To demonstrate this fact, he invented Pointillism, the artistic process of using tiny dots of basic colors to produce an image. The same way your printer does. 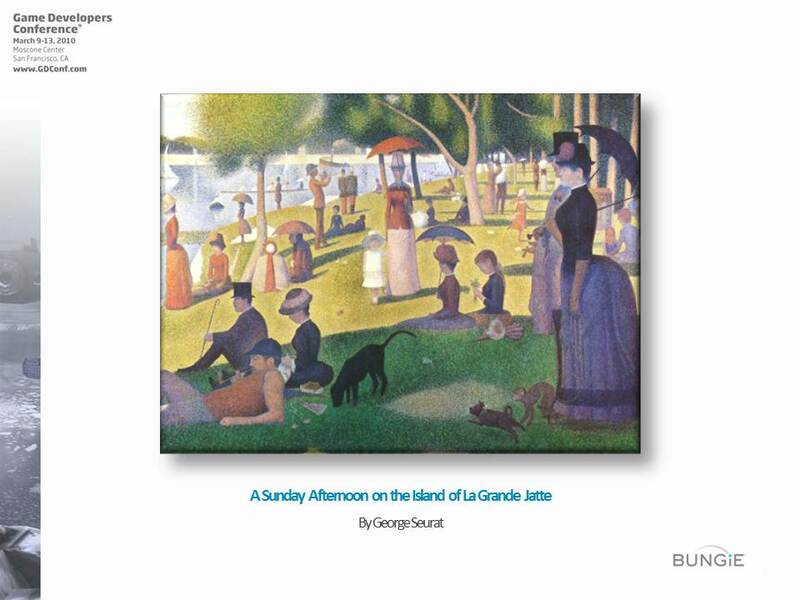 There is a really great play called Sunday in the Park with George that I recommend you see if you are interested in learning more. You can skip the final act, though. So here is the actual title of my talk. 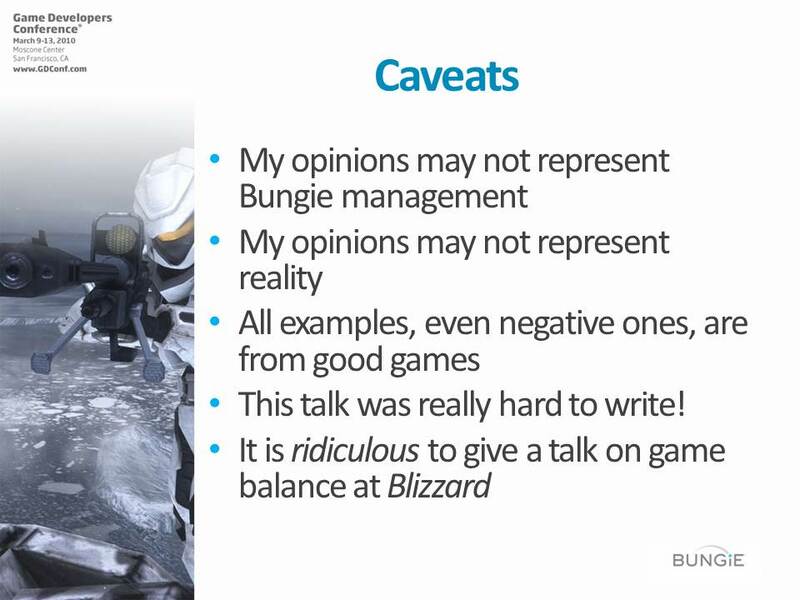 My opinions may not represent Bungie management. In fact, I know they don’t. (If I only knew the irony of that statement at the time!) My opinions may not represent reality; this is the past as I remember it, but as we will find out, brains are not reliable. All examples, even negative ones, are from good games. I tried to pick on games that everyone knows are great, to avoid controversy. 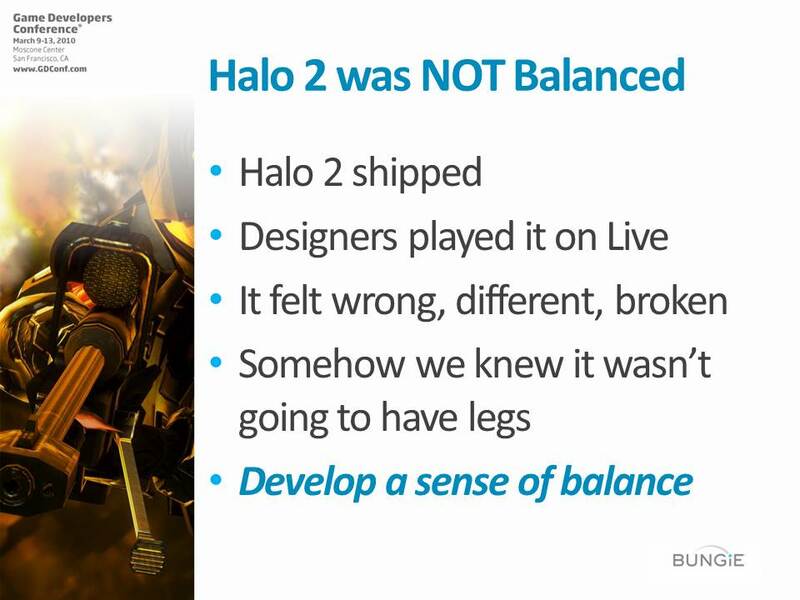 First, some context from Halo 2. 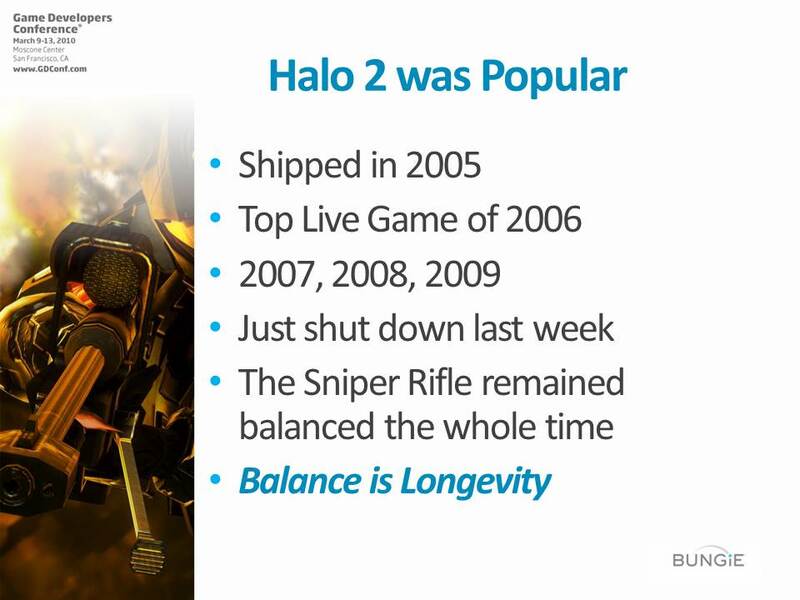 Halo 2 wasn’t just popular, it was popular for years and the Sniper Rifle remained balanced the whole time. It never needed to be changed, limited, banned, it was still fun. 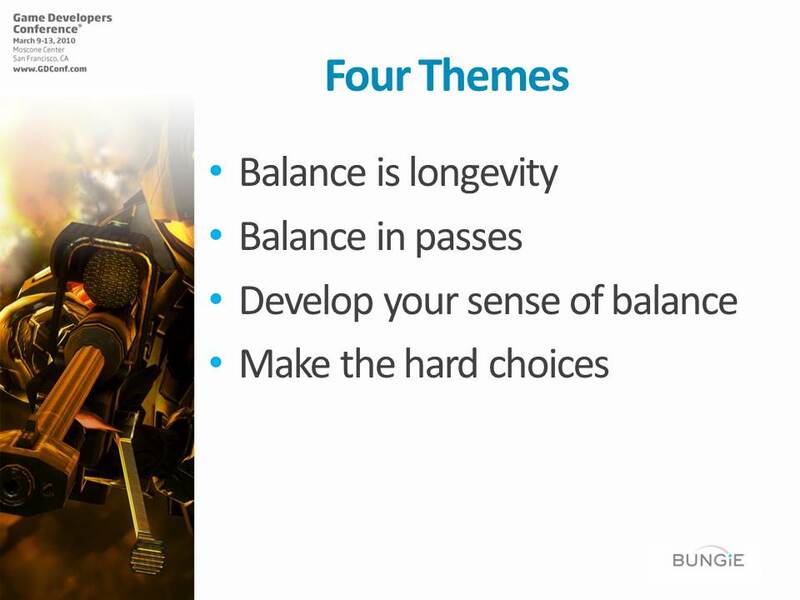 This can give us a practical definition of Balance: Balance is Longevity. Balancing an equation is a process. 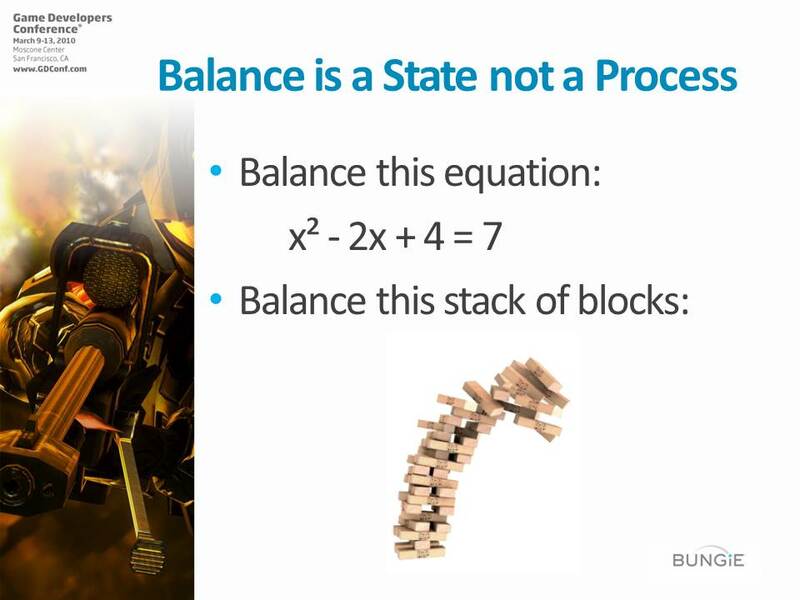 But game balance is a state that either exists or it doesn’t. 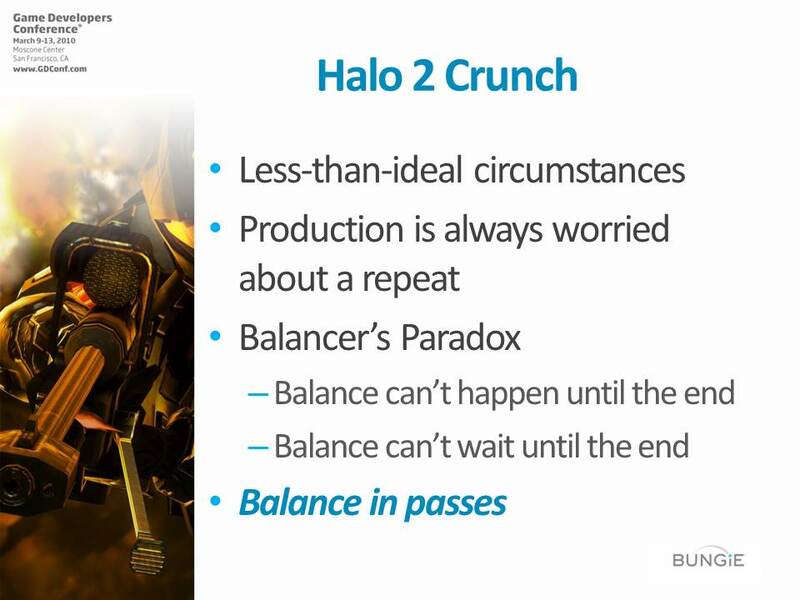 There have been other talks about Halo 2’s crunch; I’m not going to re-hash them. My really quick personal post-mortem: Don’t set yourself up to try and fix bugs in the Tutorial and balance the Weapons at the same time, It’s not going to work. At least not without wrecking your personal life. Production is always worried about a repeat. (As you can tell during this talk, Production and I have a love-hate thing going. It is mostly a joke, but Deisgn and Production have very different goals and the game is only going to work if they cooperate.) 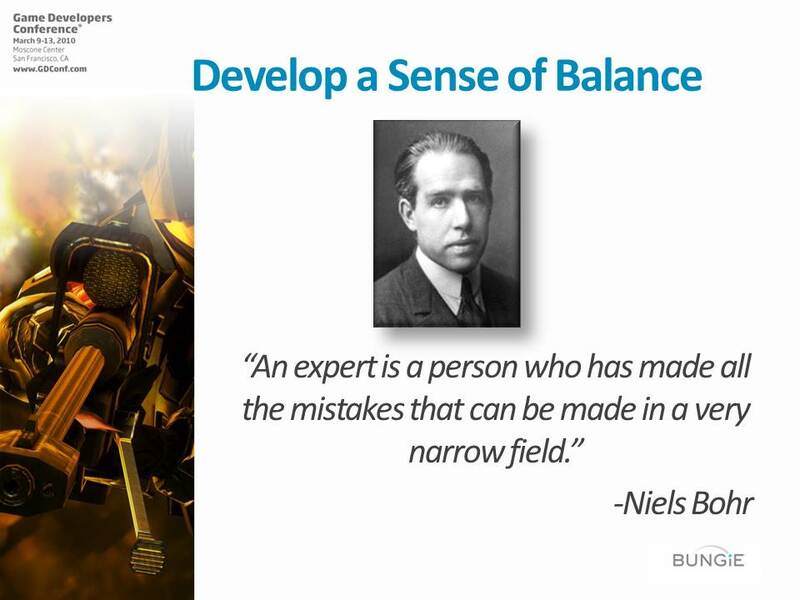 They were always asking me when I am going to be done, so I invented the Balancer’s Paradox. – I can’t balance the engagement distance until we set the Sniper Rifle damage. At the end of each pass, the game is balanced to a certain level. Once a game is balanced to that level, do not backtrack. 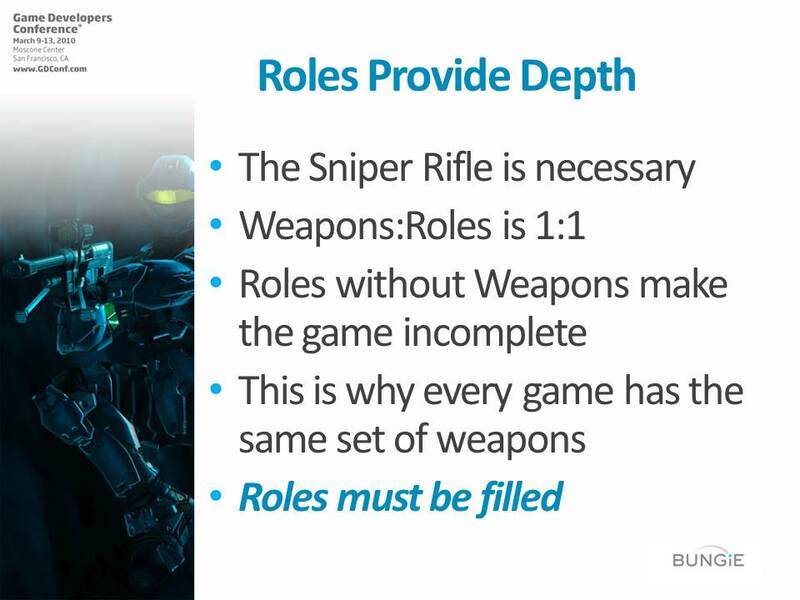 Basically, what this means is that if you have balanced the strength of a game element, don’t make it weaker in order to limit the roles of that element. Unless you have to, of course, in whic case it will impact the schedule so you need to let Production know. 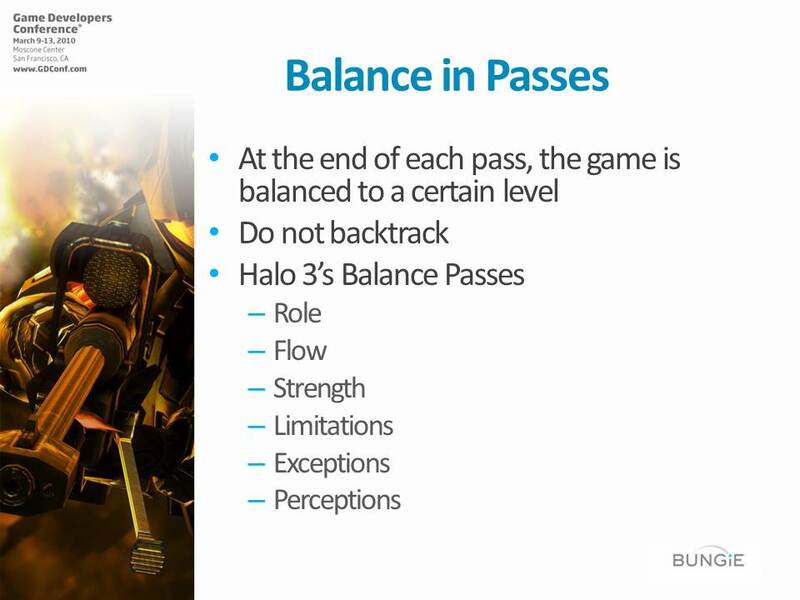 Halo 3’s Balance Passes are listed here. I think they would work for most games. They match with stages of game development and I’ll go over them in more detail later. 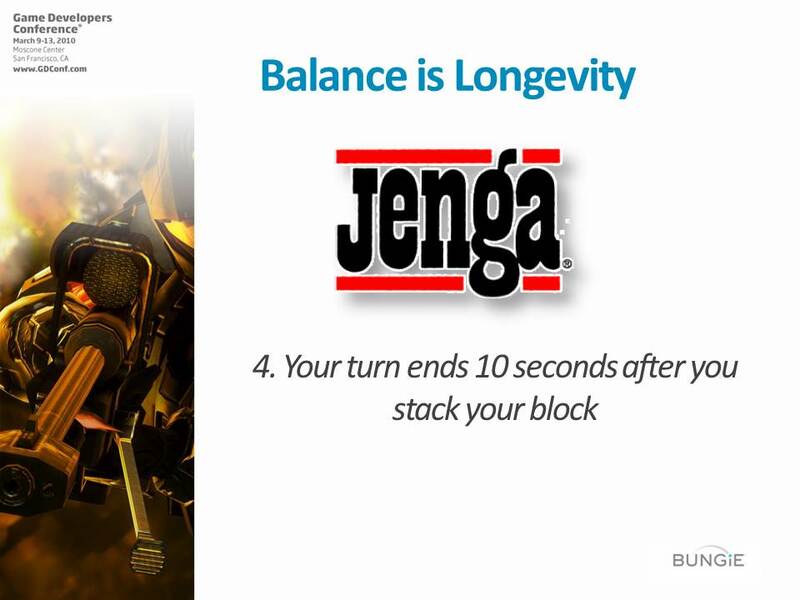 Remember: Balance is Longevity. And we could tell by playing it that it wasn’t going to last. We all had the same feeling and we didn’t really doubt it. But how did we know? We had developed our sense of balance. 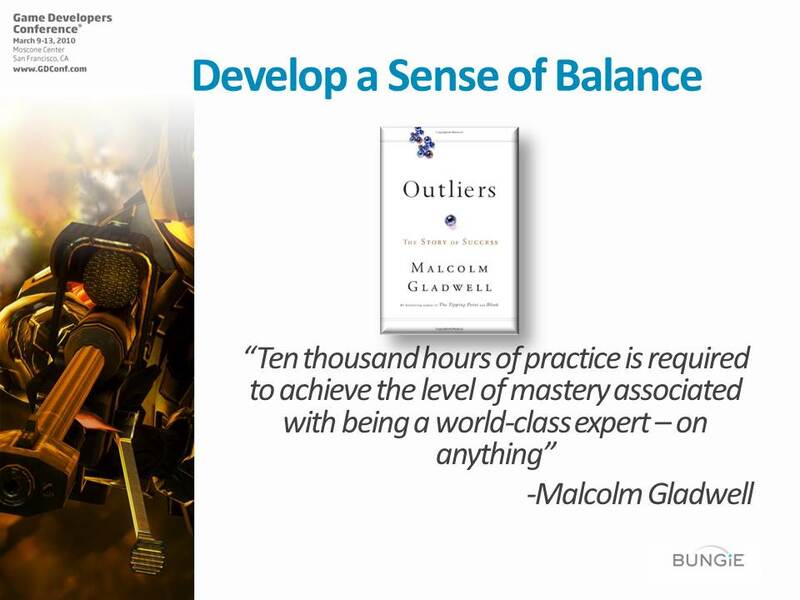 In Outliers, Malcolm Gladwell lays out his 10,000 hour rule. 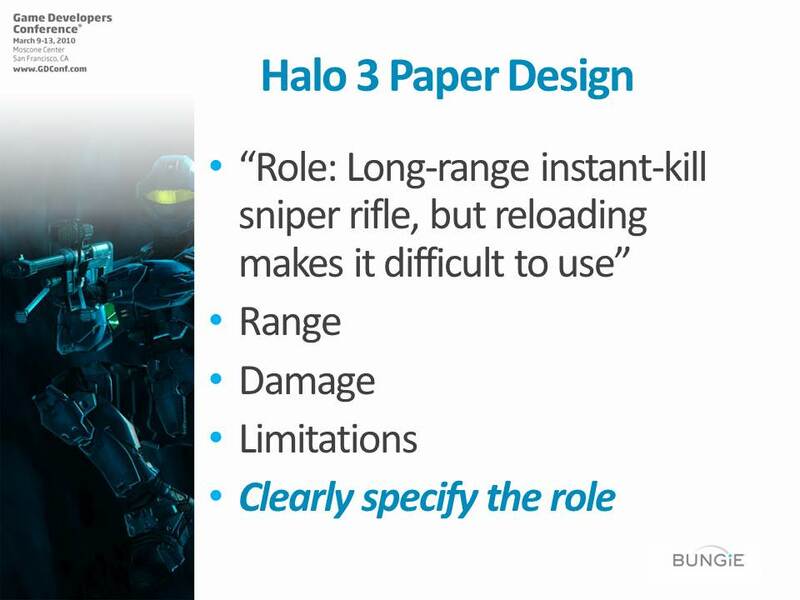 This makes me the world’s only expert in trying to balance the Halo Sniper Rifle. Sort of a narrow expertise, I admit. But what are time and mistakes? They are just experience. So why is experience so much more important to being an expert than training, knowledge or talent? 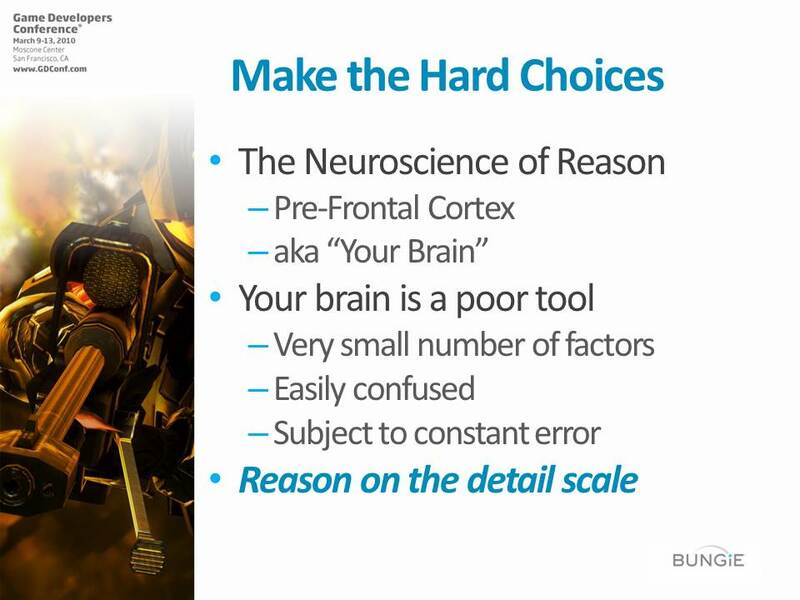 Because of how your brain works.